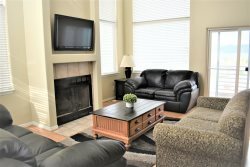 Two bedroom condo in Harbor Village. 1800 square feet on three levels. New paint as of April 2019! Lower Level Living Room- Queen Sofa Sleeper with new memory foam mattress. lot for boats and trailers at the State Marina for additional charge.